Post submitted by Board of Governors member Percy Brown III. 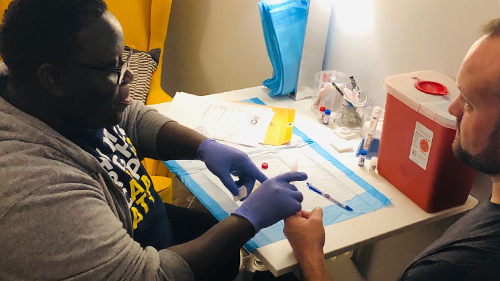 In honor of World AIDS Day 2018, I was proud to lead a team of HRC Atlanta leaders to administer free HIV testing -- a brand new experience for all of us. According to the Centers for Disease Control and Prevention (CDC), Atlanta ranks fourth among U.S. cities in new HIV diagnoses within certain populations. The CDC noted that Black gay men are contracting HIV in Atlanta in epidemic proportions. As a Black gay man and Atlanta native, I wanted to do my part to change the narrative. Seeing those statistics sparked my need for action. 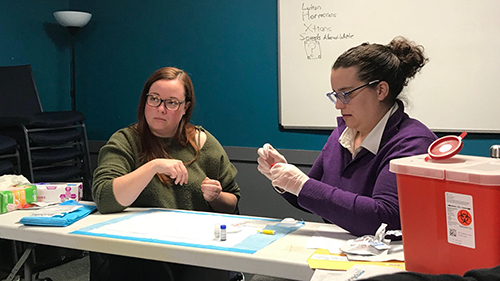 To start, we met with a facilitator from the Atlanta Harm Reduction Coalition (AHRC), an Atlanta-based organization that offers free testing year-round. AHRC operates the only needle exchange program in Georgia. Our small group of HRC Atlanta leaders were trained in basic intake paperwork and how to administer the rapid fingerstick HIV antibody test. After training in pricking fingers and collecting blood, we were ready to provide HIV testing on World AIDS Day. This past Saturday, we joined coalition partners to provide free HIV testing in our community at a local LGBTQ resource center. We served as staff for the day -- administering rapid tests, while our friends at AHRC provided support and counseling to our clients being tested. World AIDS Day is a vital opportunity to remember those in our communities we have lost to HIV & AIDS and to recommit ourselves to ending the epidemic. HRC Atlanta is ready to continue the conversation about HIV prevention and treatment in our community -- not just for World AIDS Day, but all year long. We are so grateful to The Spot and The Phillip Rush Center for their partnership. 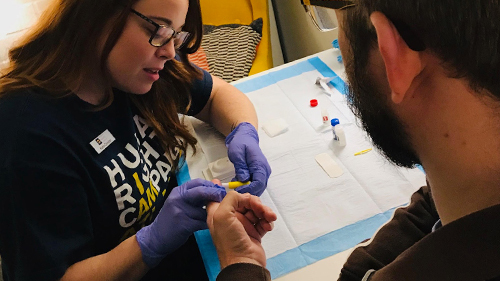 With a few of us now trained to be testers and our new friends at AHRC, we plan to add an HIV testing component to our upcoming MLK Day of Service activities and to other community events we will host throughout the year. For more information on HRC Foundation’s work to end HIV, click here.